HONOLULU— More than 80 percent of Hawaii voters support new rules protecting nearly 7,000 square miles of coastal habitat for endangered Hawaiian monk seals, according to a new poll. Also, 93 percent said it was “very important” or “somewhat important” to keep monk seals from going extinct. The poll, commissioned by the Center, was conducted by Public Policy Polling. It surveyed 646 Hawaii voters on Aug. 19 and Aug. 20. It has a margin of error of +/- 3.9 percent. On Aug. 18 the National Marine Fisheries Service designated 6,712 square miles as critical habitat for the seals under the Endangered Species Act, including pupping areas and near-shore foraging waters. Critical habitat means that federal biologists will have to be consulted before the approval of federally permitted activities — such as coastal construction, military training and water pollution permits — to avoid and minimize habitat destruction. The rule comes in response to a scientific petition by the Center, KAHEA: the Hawaiian Environmental Alliance and Ocean Conservancy. 81 percent said they support the government’s designation of 7,000 square miles of critical habitat for monk seals, 9 percent oppose it and 10 percent weren’t sure. 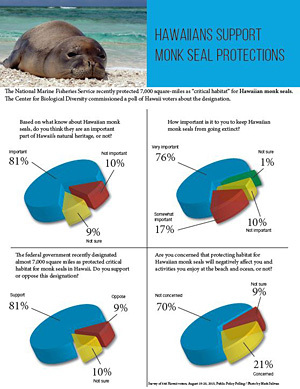 80 percent said habitat protection can help save monk seals, 11 percent said it would not and 9 percent weren’t sure. 70 percent said they were not concerned that protecting habitat for monk seals would negatively affect them or activities they enjoy at the beach or ocean, 21 percent were concerned and 9 percent weren’t sure. 81 percent said Hawaiian monk seals are an important part of Hawaii’s natural heritage, 10 percent said monk seals are not an important part of the state’s heritage and 10 percent were not sure. Scientists say there are only about 1,100 Hawaiian monk seals left, and their population has been decreasing by about 3 percent per year. The critical habitat protections and a related recovery plan are expected to be put into action next month. Click here to see the full results of the poll and here to see a fact sheet about the poll.